The notion that oil motivates America's military engagements in the Middle East is often disregarded as nonsense or mere conspiracy theory. In Blood and Oil, bestselling author and Nation magazine defense correspondent Michael T. Klare challenges this conventional wisdom and corrects the historical record. The film unearths declassified documents and highlights forgotten passages in prominent presidential doctrines to show how concerns about oil have been at the core of American foreign policy for more than 60 years -- rendering our contemporary energy and military policies virtually indistinguishable. In the end, Blood and Oil calls for a radical re-thinking of US energy policy, warning that unless we change direction, we stand to be drawn into one oil war after another as the global hunt for diminishing world petroleum supplies accelerates. Michael T. Klare, one of the world's most renowned experts on energy and security issues, is the Five College Professor of Peace and World Security Studies (a joint appointment at Amherst, Hampshire, Mount Holyoke, and Smith Colleges and the University of Massachusetts at Amherst) and Director of the Five College Program in Peace and World Security Studies (PAWSS), positions he has held since 1985. He is the author of thirteen books, including, most recently Rising Powers, Shrinking Planet: The New Geopolitics of Energy (Metropolitan Books, 2008), Blood and Oil: The Dangers and Consequences of America's Growing Dependency on Imported Petroleum (Metropolitan Books, 2004), and Resource Wars: The New Landscape of Global Conflict (Metropolitan Books, 2001). Professor Klare has written widely on U.S. defense policy, the arms trade, global resource politics, and world security affairs. He is the defense correspondent of The Nation magazine and a Contributing Editor of Current History. He also regularly contributes to various publications including Foreign Affairs, Foreign Policy, Harper's, International Security,, Le Monde Diplomatique, Newsweek,, Scientific American, Technology Review, Third World Quarterly, and World Policy Journal. Professor Klare received his B.A. and M.A. from Columbia University in 1963 and 1968, respectively, and his Ph.D. from the Graduate School of the Union Institute in 1976. MICHAEL KLARE ON "MIDWEEK POLITICS WITH DAVE PAKMAN"
OIL AND THE "NEW INTERNATIONAL ENERGY ORDER"
"Powerful! Provocative! A must see!" 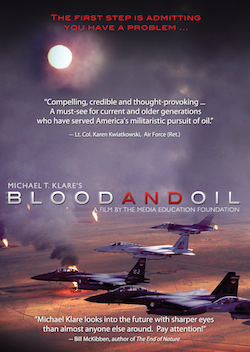 "The film of Michael T. Klare, Blood and Oil, provides an invaluable visual and oral historical overview of how intertwined the U.S. foreign policy agenda and private U.S. interest in controlling foreign sources of oil have been since World War II. This film should be available in every school film library from high school to university. I strongly recommend it." "Michael Klare looks into the future with sharper eyes than almost anyone else around. Pay attention!" "Michael Klare's analysis of the role of oil in U.S. foreign policy since 1945 is indispensable to an understanding of the critical problems we face. I hope that this lucid and historically accurate film is widely seen." "Blood and Oil is a compelling, credible and thought-provoking history lesson for all Americans. A must-see for current and older generations who served America's militaristic pursuit of oil, and for their children who will soon be required to conduct a serious intervention at home to heal this nation's blood for oil compulsion." "Blood and Oil is an indispensable primer on the role of oil in driving US military policy. Every peace activist, every environmental activist, and every concerned citizen should see this film for the perspective it provides on how to free the U.S. and the world of our addiction to oil." "A thought-provoking contemporary history lesson, this is highly recommended." "... An absolutely necessary -- and totally riveting -- documentary that every American must see to fully understand the events unfolding around us in today's world." "Blood and Oil zeroes in on the most fundamental issue of our time - the intersection between oil and war. With a surgeon's precision, Michael Klare exposes our recurring pathology: Overconsumption of oil leads to imperial interventions and support of dictators, making us the target of terrorist attacks, which in turn lead to more interventions. A must see for the general public who has been duped into believing that we make war to liberate the natives rather than to liberate "our resources" from their lands." "Michael T. Klare's Blood and Oil is a thoughtful and important look at the history of U.S. dependency on petroleum. It is an important contribution to understanding how our nation got itself into the dire and completely avoidable addiction to a substance that threatens both our global economy and our planetary survival." "...a very, very well made film"
"Digging into the archives of military history, Klare discerns a clear pattern: Presidential commitment to oil addiction entails mounting costs and loss of life." "Like cherished notions of American 'innocence' (which is strangely capable of being lost repeatedly) or horror at any suggestion of Washington's imperial reach, the notion that the United States strives to keep control of the world's oil supplies seems so untenable to American public opinion that pointing this out in a film boldly entitled Blood and Oil seems outrageously challenging. When Klare's producers unearth a series of clips of American presidents and high functionaries saying the unsayable, their juxtaposition seems to amount to an uncommon revelation." "Blood and Oil makes it plain and simple -- it's the oil, stupid. Michael Klare provides a chilling and compelling argument that oil is and has been at the foundation of many dire conflicts around the world. The film dramatizes this fact with gripping historic footage of the confluence of oil and militarism." "Laying his case out rather like a seasoned prosecutor, Michael T. Klare incontrovertibly and beyond a doubt demonstrates in this film that, as writer Jim Holt put it, 'It's the oil, stupid!' Not that the film doesn't open with Bill O'Reilly and Sean Hannity separately ridiculing the very idea. But in this documentary structured as a kind of illustrated lecture, Klare, Five College Professor at Hampshire College, convincingly shows that, more than any other factor, it's the insatiable appetite for oil that has driven American foreign policy since the end of World War II -- not only in the Middle East but elsewhere in the world as well. The evidence overwhelms. Highly recommended." Discounted pricing is available for community colleges, high schools, nonprofits, public libraries, and individual educators. Learn more. Already approved? Login to view discounted pricing. © 2015 - Media Education Foundation. All rights reserved.